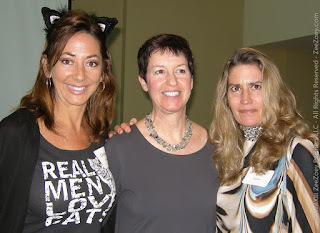 Alley Cat Allies in Ft. Lauderdale Feb 2013 ~ Pawsitively Humane, Inc.
Alley Cat Allies, headquarters in Bethesda, Maryland, was founded in 1990 by two women who recognized that stray and feral cats’ welfare were not being met by the animal control and shelter system. They are now the only national advocacy organization dedicated to the protection of these cats and were the first organization to introduce and advocate for humane methods of feral cat care, particularly Trap-Neuter-Return (TNR). 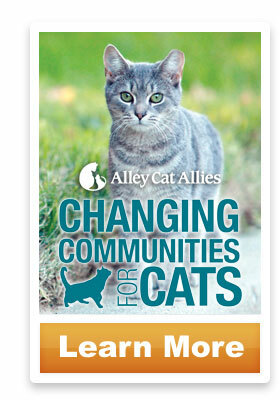 Now, 20 short years later, Alley Cat Allies has established care standards and has brought the humane treatment of cats into the national spotlight. Cats are animals too. Major cities and animal protection organizations across the country support the efforts and more than 260,000 supporters look to Alley Cat Allies for leadership in the movement to protect cats’ lives. While TNR has been proven to improve cats lives, it still does not protect them from their number one documented killer – being rounded up and taken to city or county shelters where 7 out of every 10 cats are killed. To change this startling statistic, Alley Cat Allies has instituted a campaign called “Changing Communities for Cats” to help transform our current animal control and shelter systems. To aid in that effort, they are touring across the county with educational seminars aimed right at the source - to meet with the key people in local communities who actually work tirelessly on behalf of these cats each and every day to make systemic changes at the community level. 1. Approximately 20% of the phone calls the Feral Friends Network (call center for Alley Cat Allies) receives is from the State of Florida. 2. A significant “social movement” has occurred within mainstream society as TNR and spay/neuter have changed the scope of veterinary medicine. 3. Current data regarding cats and dogs in shelters, on the streets, and those that are euthanized is very unstable and reliable documentation must be put into place. 4. Cats have been killed for over 100 years by animal control. If that solution really worked, we would not continue to have cat overpopulation to the extent we do. 5. Figures on cats killing birds highly are erroneous and exaggerated. A select few are repackaging and broadcasting the same misleading headlines to garner media attention. These individuals target only cats and disregard other studies that point to humans, urbanization, and other known causes for impacting bird populations. 6. The number one threat to cats is the system known as animal control. 7. The definition of euthanasia has changed – it used to mean it was for ending pain and suffering. Now, very healthy cats are killed in the name of animal control. 8. Myths about cats remain a big problem and we must educate people to debunk them. "You are doing everything right", says Robinson to conference room of over 100 attendees. The audience consisted of average residents who volunteer in their communities in managing cat colonies, small non profit rescues, and a handful of veterinarian technicians. Robinson is referring to TNR and TNRM. "You know it works, but sadly we are working in parallel to a system that is outdated." Robinson is referring to laws surrounding animal control and shelters that were created over 50 years ago. Robinson then announced an initiative to help concerned residents work with local government officials and begin the process of educating elected officials at the local, county and state level and bring legislation to date with science and proven successes of TNR and TNRM. At Pawsitively Humane, Inc. we were thrilled to hear this news. We strongly believe that to correct this community ailment requires a three point solution. 1. Low cost TNR teams and spay/neuter clinics. 2. Comprehensive city-wide education and awareness campaigns to educate the public and engage the average resident. 3. Educate local government and work towards updating laws. Here in Miami-Dade county we are fortunate to see the passing of the Pets Trust which aims to tackle points one and two. While other cities like NYC is progressing, where residents, professionals, and local come together with solutions to improve conditions, it seems Florida cities are going backwards. Broward County, Tampa, Pompano Beach have been in recent news of taking steps to pass laws prohibiting residents to feed or care for neighborhood cats. This is despite the fact that residents have invested their own money to have the cats spayed & neutered and not reproducing. Thankfully Alley Cat Allies will be leading efforts for the third solution. The first priority is Pompano Beach where the mayor agreed to a temporary halt on the feeding ban. We encourage concerned residents and readers to follow these important updates. You can receive automatic updates by registering your email on the right bar.